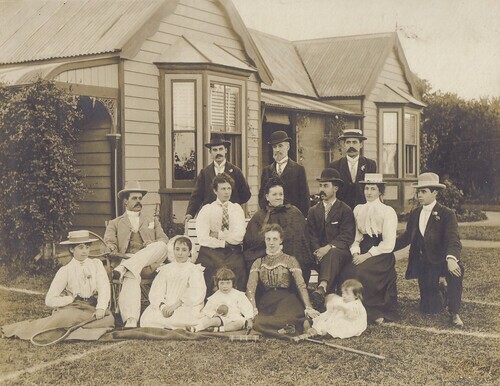 This family portrait of the Lord family in Christchurch, New Zealand has always fascinated me. My Grandma had it in an old suitcase of photos. She could name some of the people in the photo and the rest we can only guess at this stage. If anyone can shed light on the people in the photo, please let me know. I would be extremely excited to know. For some reason my ancestors decided to leave the backs of their photos blank which has been extremely frustrating to me and other family members. Front Row: Ellen Mary Lord, Rosamond Emma Stewart, possibly Ivan Spencer Lord , Alena Elizabeth Lord (née Wilson), possibly Selwyn Rex Lord. Taken c. 1900 location - Bealey Street was written on the back of the photo. Fred Lord lived at 112 Bealey Street, Christchurch (now called Bealey Ave). This is not all of the family.